In 2011, the world watched amazed as people across the Arab world stood up to demand change. 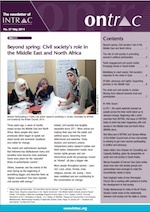 Beginning with a short overview from INTRAC, this issue of ONTRAC looks at what has been happening with civil society in the Middle East and North Africa (MENA) since. Rod MacLeod of INTRAC and Tamara Alkhas of the British Council look at how civil society is working to get more women participating in politics and advocacy. Salem Aldini, from Ghadan for Consulting and Capacity Building, gives his perspective on youth and civil society in Saudi Arabia. Marwa Kuwaider of Human Care Syria writes about how new civil society groups and partnerships have emerged to meet the humanitarian needs in Syria. Rula Daghash looks at how Norwegian Church Aid is working with partners to further the development of civil society. Finally, Mohammad Al-Jribia of the Al-Thoria Studies Center looks at the relationship between civil society and the state in Jordan.